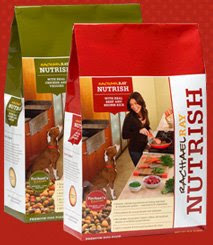 Rachael Ray has introduced a new dog food called Nutrish that is inspired by what she feeds her dog, Isaboo. All of Rachael's proceeds from the food will go to Rachael's Rescue, which was founded by Rachael to help animals at risk. You may have heard of the first beneficiary of the charity - "a terrier mix named Spirit that made national news earlier this month after a man was caught on videotape savagely beating it at the U.S.-Mexico border." The charity has offered to cover all medical costs. Here's what Rachael had to say about Rachael's Rescue: "It seemed like not a lot of extra time to donate to something that could potentially raise millions of dollars for championing these little creatures that can't speak for themselves." Don't worry cat lovers - she also has a line for cats planned. There are also crunchy and chewy treats named after Isaboo, called Isaboo Booscotti. The flavors are "bacon and peanut butter; and Isaboo Grill Bites chewy treats come in beefy burger and bacony burger flavors." I'm actually hoping to try it out on my pup once he finishes the bag of food we're on now for him. The fact that the money raised from the sale is all the reason I need to buy it for him! Plus, it sounds like it's pretty healthy! I have seen it at Kroger's,I read ingredients,Its got corn and wheat gluten ,which is a no ,no in a good grade of pet food. I would have bought it other wise. well, I bought it for my pup and he ate it last night and loved it! so a good review from my dog!